NEW YORK, NY Ted Moudis Associates (TMA), a leading architectural and interior design firm, has been recognized by the CoreNet Global New York City chapter for its design of IPG UM’s new headquarters with the 2018 Commercial Interior Project of the Year. The award was presented at CoreNet NYC’s Annual Meeting & Volunteer Appreciation Reception on June 28th. 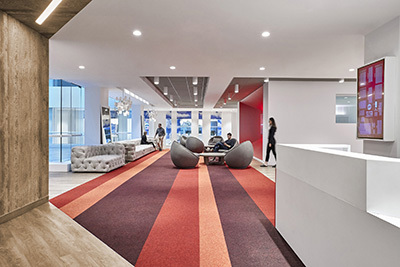 UM enlisted TMA’s services to design a new 95,000 s/f space on the eighth floor of 100 West 33rd St. that transformed the firm’s work culture from a traditional office model to an agile workplace and provided opportunities to highlight UM’s brand. TMA created neighborhoods to reduce the scale of the space and provide self-sufficient team work areas. Each neighborhood is entered via a “portal” that announces its name for wayfinding purposes and a sense of place. The office’s perimeter features exposed ceilings and clusters of decorative lights, and a variety of workspaces can be found here, ranging from traditional desks, standing height high-tops, lounge seating and oversized daybeds. Walls in this area are highlighted by varying tones of red, UM’s signature color. Serving as a focal point for the space is a townhall, a college-quad-like area, with moveable furniture that allows for casual meetings for groups of all sizes, and circulation to cross into other areas of the office. Bordering the townhall are banquette booths which provide staff alternate work areas for working or meeting. A large screening room adjacent to the townhall allows UM to host informal presentations in a more relaxed atmosphere while serving as a space for internal meetings and screenings. The room can expand via a large glass garage door that opens up to the townhall space. A big café provides a space for constant daily use, not only for meals, but for small meetings, large presentations and townhalls. One of UM’s main branding concepts is to create “moments that matter”; moments that become starting points for conversations, moments that create memories, moments that make us smile. In this spirit, TMA created a “Sky Lounge,” a white space with cloud graphics throughout, applied in such a way to create a surrealist play between reality and illusion. Stepping into this area, staff can enter a new world in which to work. TMA received the 2017 Commercial Interior Project of the Year over 75,000 s/f for its design of a new, 145,000 s/f headquarters across three floors for Foot Locker at 330 West 34th St.